Developing leaders in our community, the RGV Leadership Summit will be held at the HCISD Performing Arts Center, 3217 W. Wilson Rd., on May 8. Community members are invited to attend the event, which will be a live broadcast of speakers from around the world, who bring unique perspectives and experiences on leadership. 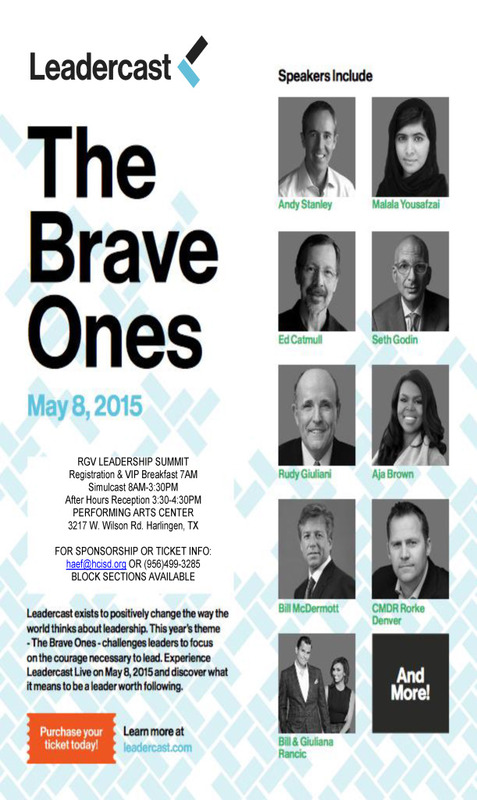 Speakers include Malala Yousafzai, Andy Stanley, Seth Godin, Rudy Giuliani and Ed Catmull. CEU certified program for attendance. Tickets will be $99 with bulk pricing available upon request. Lunch will be included during the event. Registration will begin at 7:00 a.m. The sessions will last until 3:30 p.m. with an after hours performance beginning immediately after.